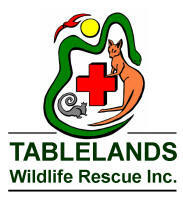 Tablelands Wildlife Rescue is a new wildlife rescue organisation established on the Atherton Tablelands in Far North Queensland. We have a team of experienced and dedicated wildlife carers who have been wildlife care specialists for many years. EMERGENCY CARE: I've found sick, injured or orphaned wildlife - what do I do now? Like a first aid situation involving humans, time is of the essence and the steps that you take in early stages could mean the difference between life and death for the animal. No doubt, finding an injured animal is stressful for you and the animal, but your actions can make a big difference! View and enlarge the images provided here and contact us on our emergency number 07 4091 7767 for advice and assistance. If you live on the Atherton Tablelands and want to learn more about our native animals - contact us and apply to join! Would you like to have a carer visit your community or school group to learn more about caring for native wildlife? Contact our hotline on 4091 7767 or send a message us to arrange a date. Please see visit our facebook page and website for more information, forms etc.